A set of four Fischer Leuchten wall lights, each with a gilt metal plate with a single light fitting with waved, curved glass shade. Rewired and PAT tested. By Holm Sørensen & Co.
Set of four French gilt metal and crystal sconces, 19th century. A set of four neoclassical beaded presidential wall sconces. This bronze light fixture features decorative crystal accents. 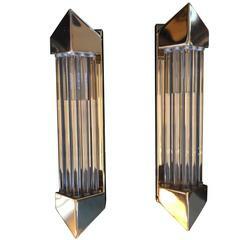 Two sconces in copper and glass. Height 40 cm. Width 25 cm. One E14 bulb.